I can count on one hand how many times I'd been in Michaels crafts until I saw a video on Facebook about creating geodes out of resin, paint and crystals. And, BAM! I was hooked. Now I've been to Michael's so many times that when I asked our son for a gift card for Mother's Day, he stuck out his hand, introduced himself, and asked me "who are you and what have you done with my mother'. I was in a menopausal funk and found my way out through liquid art. The meditative, creative, nothing-is-a-failure world of liquid art. I jumped in with both feet and haven't looked back. I love the process and consider each experience just that - an experience. Whether it's resin or acrylic art I'm having fun engaging my soul and senses in a way I haven't done in years. Now I know why people have hobbies. And I now understand the statement "I work to support my hobby'. But it's worth it. My soul is full and I'm happier and content again. Art as therapy - it's true folks. So, join me for a painting class and get inspired. You never know what's next on your journey! Private and Business Paint Parties! 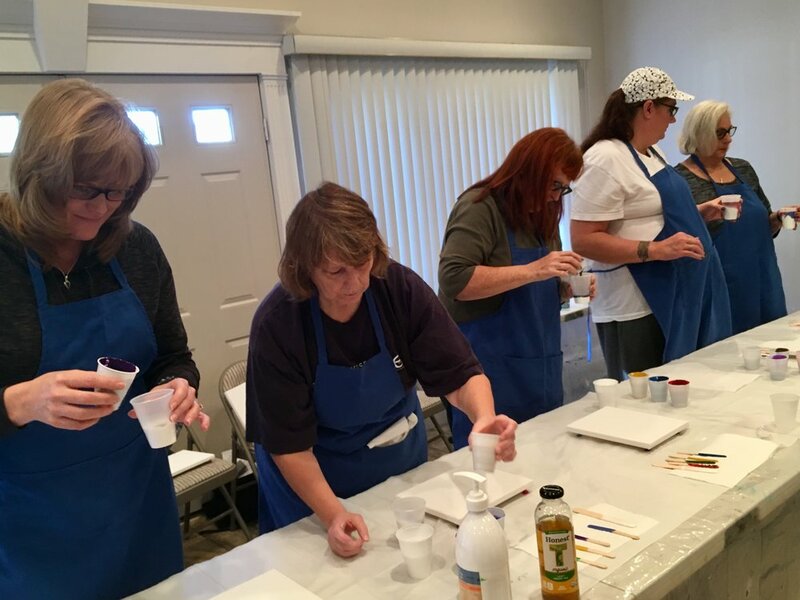 We’ve been having a blast holding private liquid art paint classes at peoples homes and public classes held at businesses around Sioux Falls. The host or business owner gets to paint for free! We provide everything but tables and chairs. If this is something you’re interested in please contact us for more details..
$30/person for a business party. The business receives $5/person as well as the opportunity for one employee to paint for no charge. $25/person for a private party. The host gets to paint for no charge.. Thank you for inquiring about a private liquid pour class for your business or your home! I will get back to you as soon as possible. Bring a couple paper box lids or a large cookie sheet that has a lip (not a flat one) to transport them safely home. Pre-registration and payment required. Click the "REGISTER" button below and indicate which class you're interested in as well as your contact information. Or call or text Jill at 605-413-8852. Jill will contact you to confirm your registration and payment information. For the class at Wine and Canvas please contact them directly to register: 605-951-5346. Acrylic liquid pouring has become very popular as a fun and accessible painting technique for everyone - beginners and experienced artists alike. Join Jill and Dan Johnson and learn a few techniques of this creative painting process. You’ll learn about the process, see the techniques demonstrated, and then have fun creating on your own. April 8 - Come Paint With Us!! 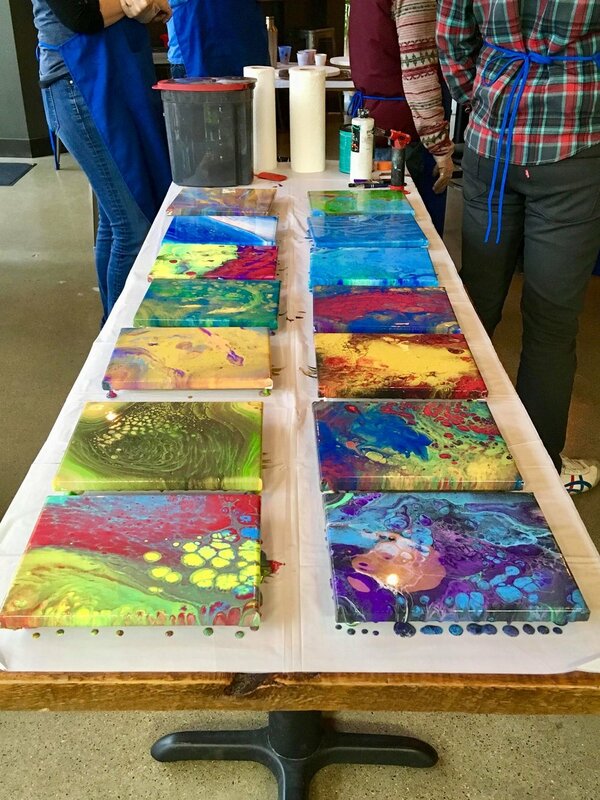 Join Jill and Dan Johnson at Mosaic Studio and learn a few techniques of this creative painting process: dirty-cup, flip-cup pouring, swiping and ring pouring. You’ll learn about the process, see the techniques demonstrated, and then have fun creating on your own. Everyone receives 2 8x10 canvasses. Class size limited to 15. April 13 - Pour and Pub!! 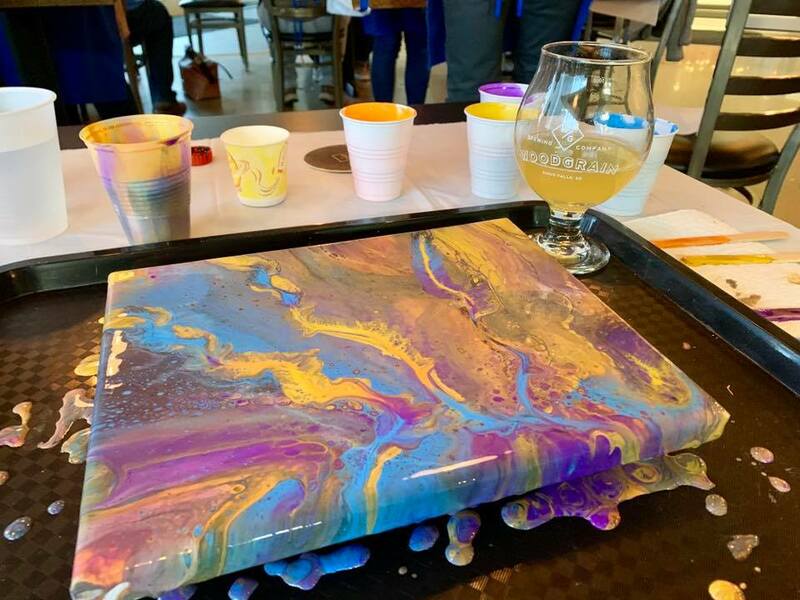 Join Jill and Dan Johnson at Woodgrain Brewery and learn a few techniques of this creative painting process: dirty-cup, flip-cup pouring, swiping and ring pouring. Everyone receives one 8x10 canvass and one either circular, hexagon or triangular to paint. The energy of these shapes is amazing and the process is the best therapy ever. The taps will be open so you can purchase a brew, or two, if you’d like. Class size limited to 15. April 14 - Come Paint and Have Some Wine With Us!! 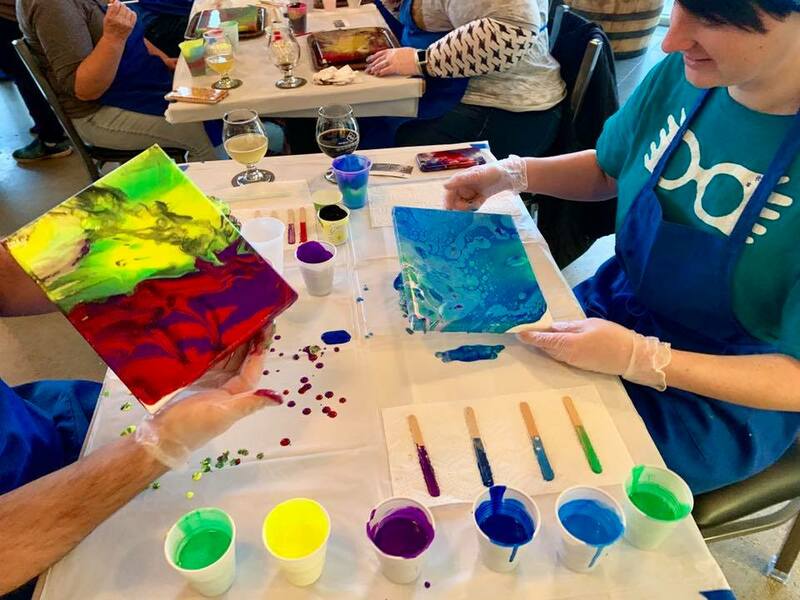 Join Jill and Dan Johnson at Wine and Canvas and learn a few techniques of this creative painting process: dirty-cup, flip-cup pouring. Please call Wine and Canvas to register and for all the details. Class size limited to 20. May 18 - On The Road!! 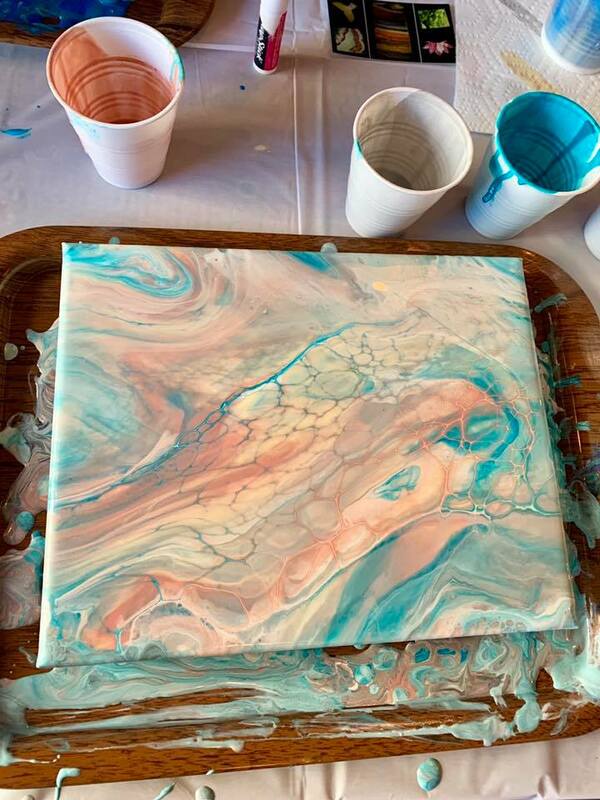 Join Jill and Dan Johnson in Sioux City at the Siouxland Holistic Healing Center and learn a few techniques of this creative painting process: dirty-cup, flip-cup pouring. Everyone receives 2 8x10 canvasses to paint. Class size limited to 15. 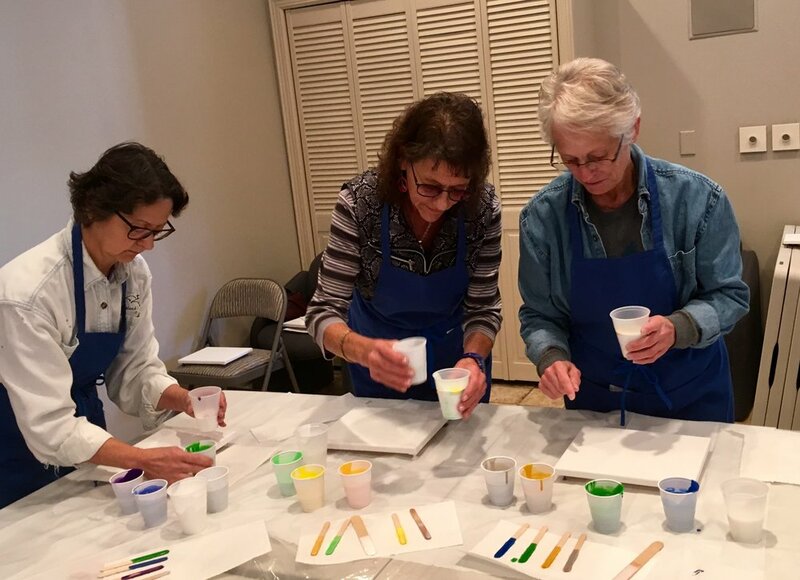 Thank you for your interest in the Liquid Art Painting Class! I will contact you for payment. 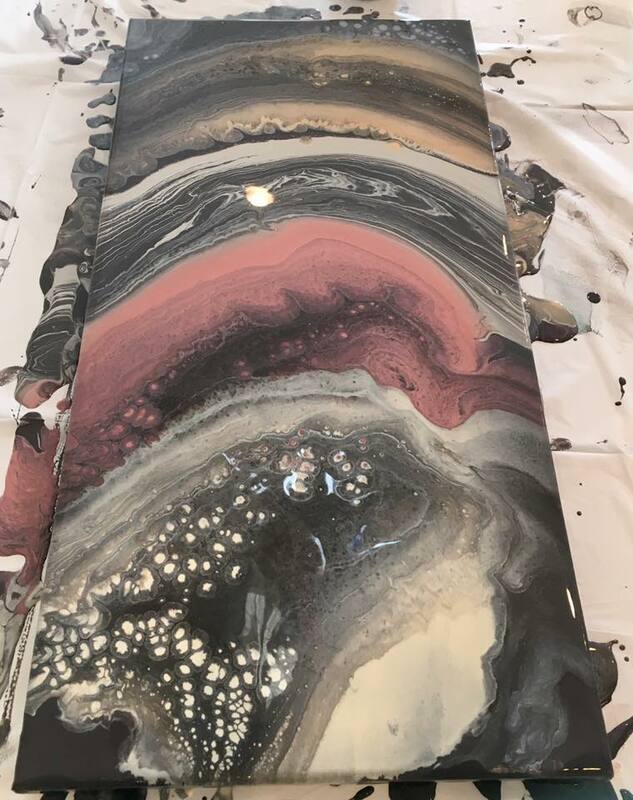 Acrylic liquid pouring has become very popular as a fun and accessible painting technique for everyone - beginners and experienced artists alike. Join Jill and Dan and learn the technique of woodgrain pouring. Create a painting that looks like woodgrain. There's a technique to it, but once you experience the basics you can play with the recipe and pour stunning, realistic woodgrain pieces. You’ll learn a little about the process, see the technique demonstrated, and then have fun creating on your own. Everyone receives one canvas to paint. 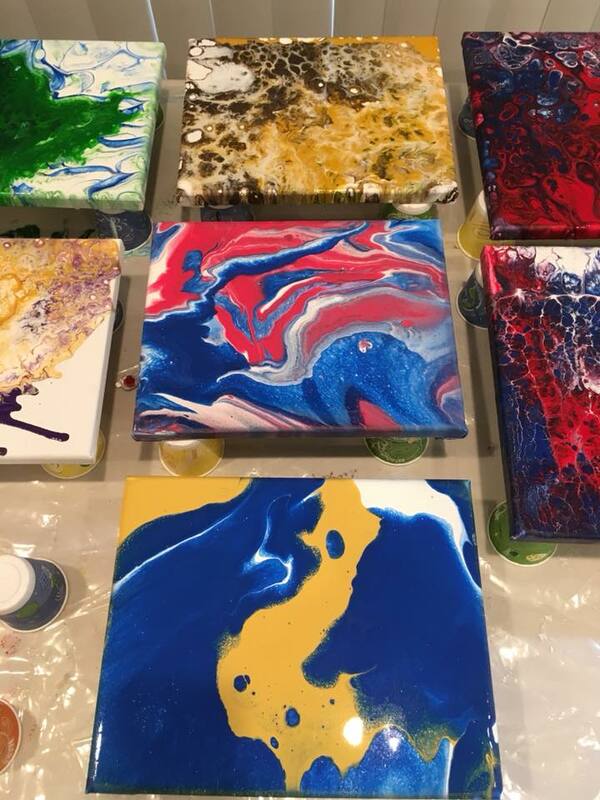 Acrylic liquid pouring has become very popular as a fun and accessible painting technique for everyone - beginners and experienced artists alike. Join Jill and Dan and learn the technique of pouring over a kitchen strainer. Whaaa??? Yep! The slots of the sink strainer creates beautiful designs on a canvas. Unique, easy and you'll be saying 'Wow!!" in no time! Below are photos of our classes. Join us sometime and have fun creating an original piece of art that’s fun and therapeutic!.